BP has now responded to Admiral Allen’s request for more information, and has obtained permission to replace the BOP and stack on the top of the Deepwater well, before completing the drilling of the relief well. They are also preparing to recover (fish for) the drill pipe that was left in the original well. • The Discoverer Enterprise will attach a drill string to the top of the existing sealing cap. • The middle blind shears of the sealing cap will be opened. • The Q-4000 will pump an ‘anti-freeze’ mixture down through the existing manifold and into the BOP’s choke and kill lines. The liquid used in the flushing will be completely contained and carried to the surface through the Enterprise drill string. • Following the flushing, the sealing cap’s blind shear ram will be closed. Following successful flushing of the subsea equipment, BP will conduct an ambient pressure test to reassure that the well is secure. The test will be conducted over a 48-hour period, which mimics twice the time estimated to remove the original BOP and replace it with the Transocean Development Driller II (DDII) BOP. At the present time it appears that the well is in the 48-hour period where the well is being held at the same pressure as that of the surrounding seawater, to see if there is any gain or loss in fluid or pressure under that condition. If there is no change, then the hardware will be removed, and the replacement BOP installed. It should be evident that there will be some care needed to deal with the 3,000 ft of drill pipe that may be still attached to the lower end of the initial BOP. This was addressed in his press conference on Thursday by Admiral Allen, who introduced a new step in the process. 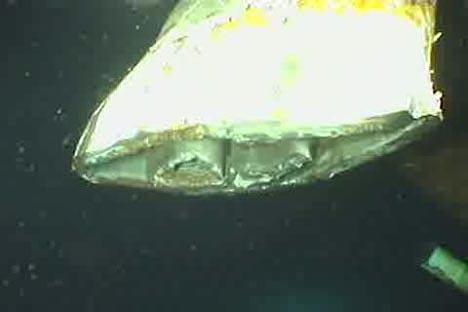 After the current pressure test is completed, BP have now been tasked with seeing if they can recover the drill string from the well, before the BOP is changed out. If you will remember when we cut through the riser pipe before we moved the stub of the pipe and unbolted the flange, we were concerned there might be pipe or even two pieces of pipe there. And one of our procedures we were prepared to do was actually put a metal band around both pieces of the pipe, pull them together so that the spooling tool could fit over the top (inaudible) that connection between the blow out preventer and the capping stack. When we actually cut the pipe and got in, we found out there was only a single pipe there. That leads us to believe that the pipe is suspended by the shears that closed but did not cut the pipe and the deep water horizon blow out preventer. And so we're working under the assumption that there is pipe suspended, held in place by the blow out preventer. We don’t know how far down it goes and we don’t know whether or not it is connected to the 5,000 feet of cement that was put in during the top kill. So after the ambient pressure test is done, it would inform us as to whether or not the BOP could be removed without hydrocarbons being emitted. The next thing will be to see if we can remove that pipe. That doesn't preclude us from removing the blow out preventer and putting another one on. It will just make it a little more complicated and BP will have to provide us a procedure on how they will do that. This fishing expedition (which was also addressed in Kent Wells discussion, though that has not been released yet) is expected to occur immediately after the pressure test, i.e. sometime on Saturday. We are going to actually put a drill bit down in the blow out preventer and attempt to extract the drill pipe. 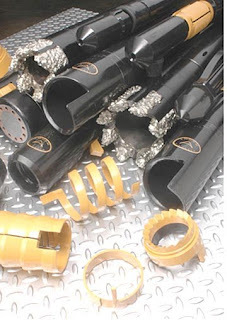 The reason we want to try and extract the drill pipe that reduces the risk that when we remove the blow out preventer and put the new one on, there won't be an (off score) or some kind of a bar to having a seal with the new blow out preventer. Bear in mind that the tool has to grip the drill pipe and hold the weight of the string under the BOP after the shear is released. The tool will have to penetrate into the deformed metal of the pipe (remember the picture of the pipe and riser other side of the shear) and get a good enough grip that it will hold up to 3,000 ft of DP. So the grip has to be a strong one. It will be interesting to see what sort of tool BP suggests using. Screen capture of the sheared section of the drill pipe and riser. There are also ongoing tests to see if the contents of the annulus can be established, since it is still not clear whether this is oil (which would indicate that at one time there was communication through the bottom of the annulus with the reservoir, and thus a failure of the annular cement around the casing) or it could be mud (from the well contents before the initial cement was injected). That may not be known, with confidence, however, until after the BOP is exchanged, and the relief well intersects the bottom of the borehole, which is now not expected to occur until after Labor Day.